Bryan is certified as a USPTA Elite Professional with a Specialty Degree in Competitive Player Development. He currently serves the Racquet Club as the club’s Head Professional. Bryan is certified by the USTA in High Performance Coaching and has completed the USTA’s highest level of Sport Science Testing. Bryan was selected both as the USPTA/Midwest Professional of the Year and the Ohio Tennis Professional of the year on three occasions. 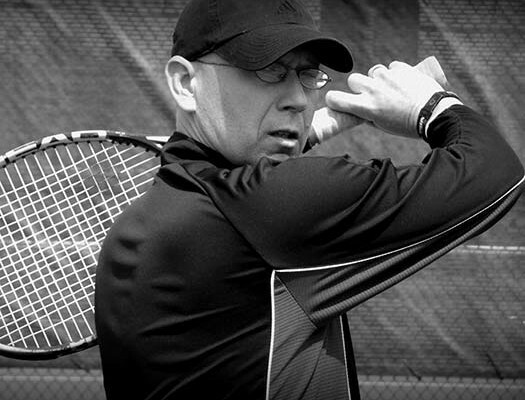 Bryan was the 2004 Winner of the USPTA National Tennis Excellence Award and in addition finished in the top ten of the nominees for USPTA National Professional of the year. In 2003 Bryan was presented the Cap Leighton award, USTA/Midwest highest honor for a teaching professional for his contributions to tennis. Bryan is the former Director of Tennis in Portsmouth (his home town). His 4.0, 4.5 and 8.0 mixed teams were Midwest Adult Champions. Before coming to RCC he was Director of Junior Competition and co-owner of the clubs in Chillicothe and New Albany, and did personal tennis training at New Albany Country Club. Bryan has been the Head Coach of USTA/Columbus Area Competitive Training Center ,Midwest Training Center All-Star Team ,USTA/Australia Cup 18’s and the OVTA 14’s Davis Cup/Wightman Cup & 12’s Team Cup (2013 Midwest Champions). Bryan has coached eight singles and doubles High School State champions since 2000, including both Kevin Metka, (undefeated in Doubles in the Big Ten in 2013) the only player in over 40 years from the Columbus Area to win Division 1 Doubles & Singles State Championships and Amanda Taylor, second in wins at Vanderbilt. Students have been Midwest and National Singles and Doubles Title holders, College All-Americans and the Intercollegiate-Hardcourt Champion. His stepson Robert Cash was the Midwest Closed singles and doubles (with Jack Dabek) Champion in 2013. In addition Robert and Jack finished third at Spring Nationals. Bryan was selected for the inaugural Midwest Coaches Commission executive board. He served USTA/Midwest on its Junior Competition Committee for ten years. Nibert has done dozens of camps for the USTA and Midwest Section including being the lead camp coach of the Easter Bowl (in Palm Springs and Delray Beach) the National Hardcourt Championships, USTA/Regional camps and Zonal team championships. In 2012 & 2013 the RCC 14 & under advanced team won JTT Midwest Championships and qualified for USTA/Nationals. Bryan lives in New Albany with his wife Cathie and step-children CJ, Alex and Robert Cash. His oldest daughter Brynn-Bethany Hanson lives outside of Chillicothe where she is Director of Talented and Gifted in her school system. Nibert has been ranked as the number one player in the Midwest, winning over 20 sectional titles. Bryan strives to create a fun and positive atmosphere. His goal is to continue to build not only a players game, but to help them gain the confidence needed to reach a higher level of personal success.